We have started to see the food trucks come out of hibernation over the past few weeks, and we couldn’t be more excited to kick off the 2018 What the Truck?! season at Capital Boulevard! We have over 15 trucks for you to choose from, including 6 food trucks* joining us for their first What the Truck?! You’ve patiently waited and here it is: the final food truck line-up for What The Truck?! at Capital Boulevard! We’ve got over 20 trucks for you to choose from, including five food trucks* joining us for their first What The Truck?! It’s going to be a great end of the season event! It’s hard to believe that our final event of 2016 is only just weeks away! Where did the summer go? 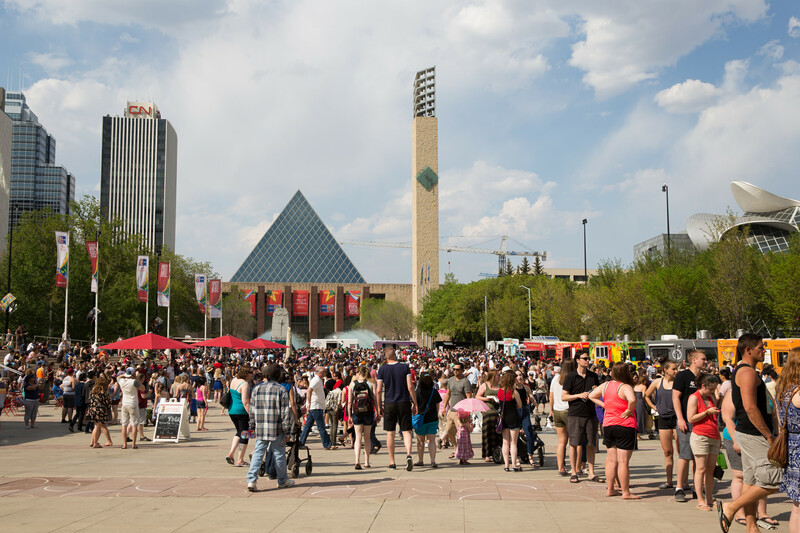 Join us at Churchill Square on Sunday, September 25 from 2 to 7 pm for our last What the Truck?! of the season. This also marks the last event at Churchill Square before its revitalization for the new LRT line. We’ll be featuring 25 trucks, rain or shine, for the final wrap-up event. Don’t forget to keep checking out Facebook event for updates and RSVP! We’re excited to have another Trucks in the Outfield event this year! Join us on Saturday, August 20 from 4-8pm the Edmonton Ballpark. Don’t forget to RSVP on Facebook here. We had a great time at the ballpark last year! Picnicking in the outfield on a beautiful day can’t be beat. And, like all of our other events, it is FREE to attend (you just purchase from the trucks directly), and parking is FREE too! Unfortunately, dogs are not permitted at the field. So make sure to bring a blanket, a ball, and a glove, because we’re going to have a great time in the outfield! You may even stumble upon some Pokemon on the way! We’re so excited to welcome Go Nuts 4 Donuts, Kabao Bun Truck, Jack’s Mobile Burger Shack, Mr. Chimi Churri, Preserve Food Truck, and The Sizzling Stick to their first What the Truck?! event! Stay tuned for our truck menus post early next week and be sure to check out the event on Facebook!